Mark Hamill has taken to social media to prove once and for all that he is not too short to be a Stormtrooper. In the original Star Wars, Luke Skywalker and the gang infiltrate the Death Star to rescue Princess Leia. When Skywalker finds Leia in her cell, he gets dissed. "Aren't you a little short for s Stormtrooper? ", the princess quips before Luke can get his helmet off. 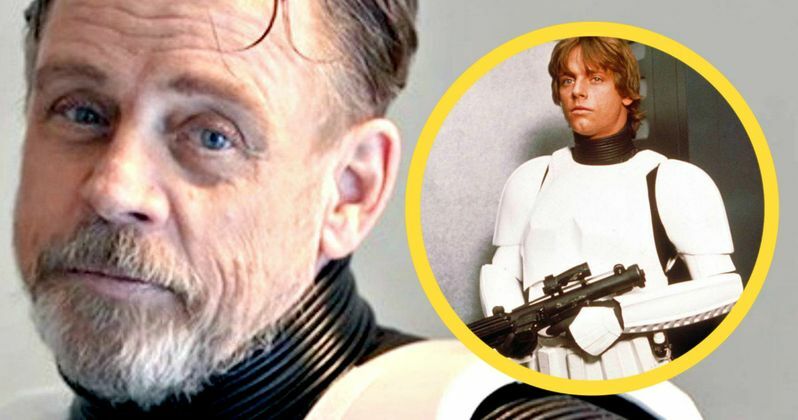 As with most things in the Star Wars universe, that quote has been picked apart and examined over and over for decades, but now Hamill has finally put the speculation to rest. The news comes to us via Mark Hamill's Twitter page and features two original Star Wars action figures being measured. One action figure is a vintage Luke Skywalker while the other is a vintage Stormtrooper and as it turns out, Luke is slightly taller than the Stormtrooper. The Luke Skywalker figure from A New Hope measured 3.831 centimeters and the Stormtrooper measured 3.8021 centimeters. Hamill had this to say. "Not to beat a dead Tauntaun, but here's irrefutable PROOF I'm TALLER than a Stormtrooper! Now let's never speak of it again ('til next time)"
The comments in response to the meme that Hamill posted continue to argue over Skywalker and the Stormtrooper's height and even get into the yellow lightsaber that the original figures came with. Many point out that the helmet of the Stormtrooper gives it the edge over Skywalker, while others are fine blindly accepting the meme that Hamill posted. Carrie Fisher's joke about Hamill's height is still getting laughs 40 years later and the topic is still being debated. In real life, Mark Hamill is 5′ 9″. Interestingly enough, fellow Star Wars actor John Boyega is also exactly 5′ 9″ tall. Boyega plays an AWOL Stormtrooper who was recruited by the First Order. Obviously, Finn was tall enough to be a Stormtrooper, so that should also help end this debate. Hamill is gearing up for his first substantial role as Luke Skywalker since Return of the Jedi and it appears that we're going to see a darker side to the character this time around in The Last Jedi. Director Rian Johnson has spoken about Skywalker's role in The Last Jedi, confirming that Luke's decision to abandon the Jedi and disappear to Ahch-To is an important question he wanted to explore and that Luke's frame of mind might be in a negative space. Hamill has also brought up the fact that Skywalker had a different path than the rest of the characters and transformed into a Jedi over the course of the first trilogy. There is potential for a lot of darkness to have occurred over the 30 years that Skywalker has been away. There's still a lot of mystery surrounding The Last Jedi, but at least Mark Hamill is out there taking care of mysteries surrounding A New Hope still. Luke Skywalker is the perfect height to be a Stormtrooper, so don't let anybody tell you any different. If Yoda can be a Jedi Master, Luke can be a Stormtrooper. The Last Jedi will hit theaters on December 15th and a new trailer is expected to drop soon and could possibly premier during a Thursday night football game like The Force Awakens. Until then, check out Hamill's Twitter post below.